Thank you for this informative post. I hope the yarn doesn’t felt on you. Then again, it may add a lovely dimension. This is so beautiful Elaine. You are an inspiration. I bet you are using this blanket a lot right now to stay a bit warmer. Beautiful! 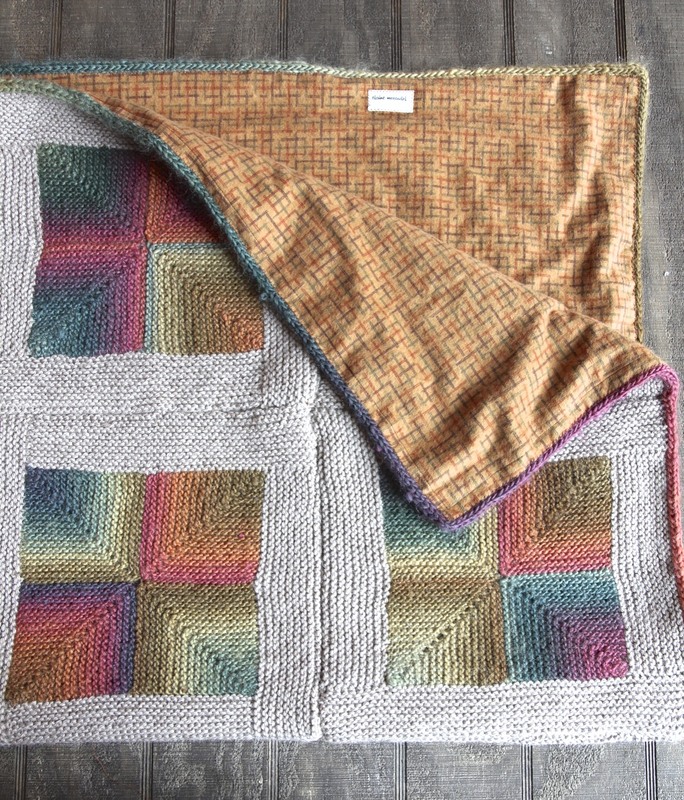 I knitted a log cabin baby blanket a few months ago and backed it with fabric, also. Now, I must do one of these! Thanks for the gorgeous inspiration. 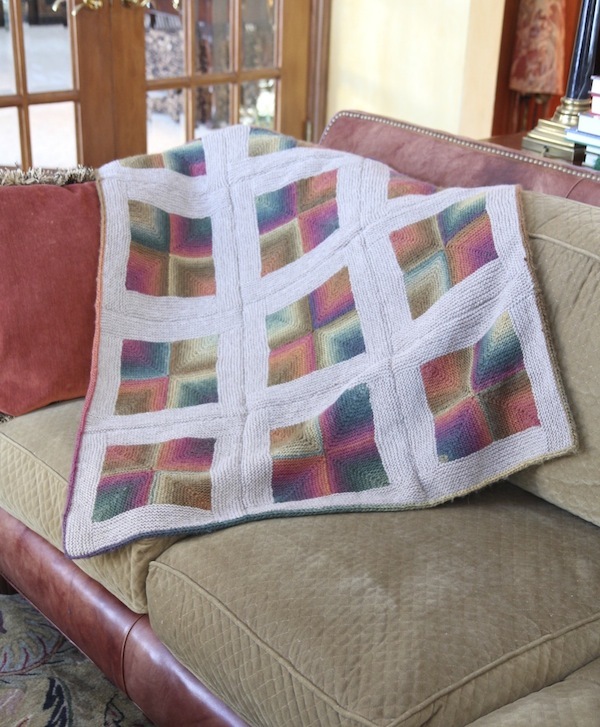 My blanket is on ravelry. My user name is sadie21jean, if you would like to take a look. Une splendeur ! Ouvrage magnifique. Bravo ! 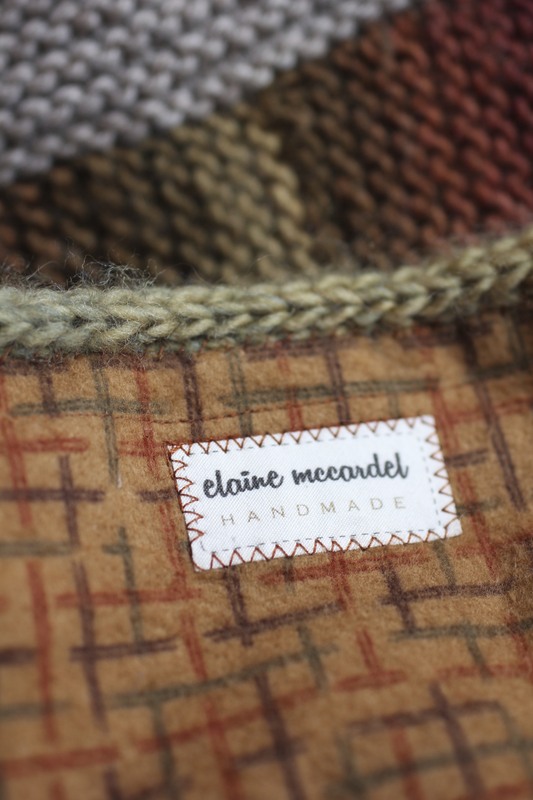 I really love this blanket and would like to give it a try. 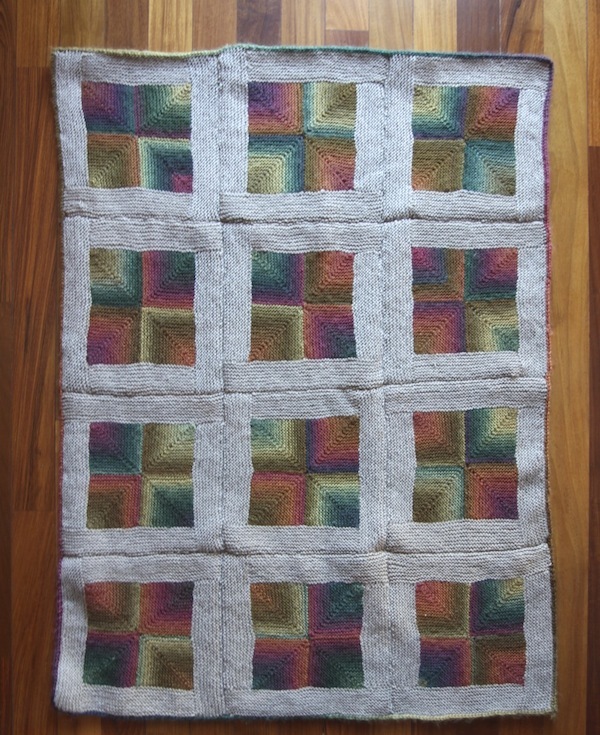 How did you adapt the pattern in order to do the squares? 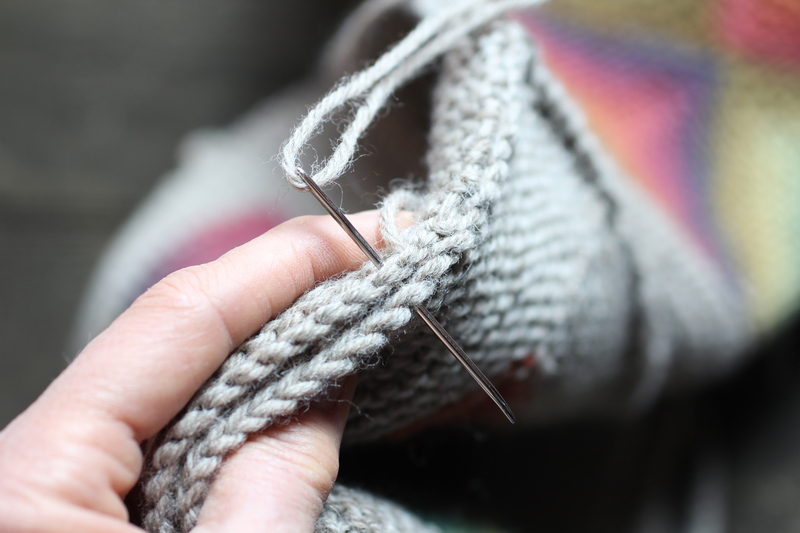 And how many skeins of each wool did you use? Sorry but for some reason I was unable to find that information. Thanks a lot in advance for your help! Natalie: It’s really easy to make the squares instead of the crosses, because the crosses require a color change. 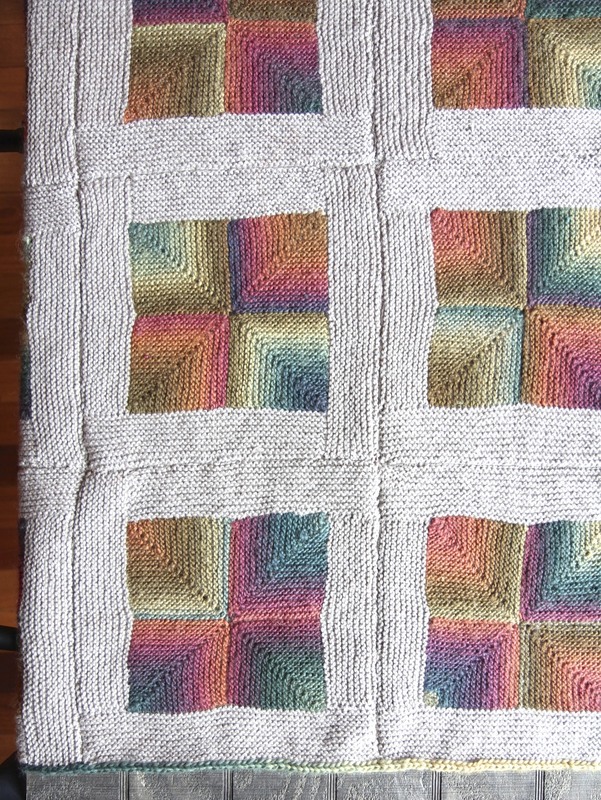 For the squares, just don’t do the color change. Once you see the pattern, it’s really obvious how to do it and easy. As for the number of skeins I used, I don’t think I kept track! I wasn’t sure how big of a blanket I wanted when I started, so I just kept buying more yarn and stopped when I got the blanket to the size I wanted. Sorry I can’t help with that! Thank you so much! That already helps a lot! It’s in the post – they are about 11″ square. Hope this helps! It’s a really fun pattern. Impressive work ! I admire your patience ! A beautiful neat piece of work!!!!!! Thank you for sharing and you’ve just taught me how to make the icord which does give a neat finish and as you said it’s is sooo easy! 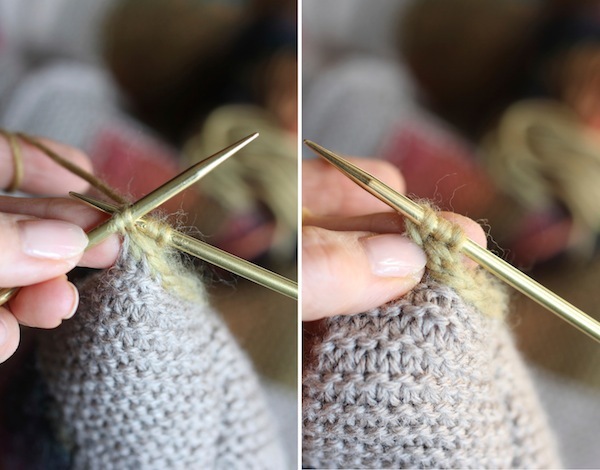 Phyllicia: Yes, it’s easy and I hope my photos help you to do it! Jenny: There is a link to the pattern in the first paragraph of the post and also at the very end of the post. Thank you….does the link tell you how to join the background color to the squares as well? 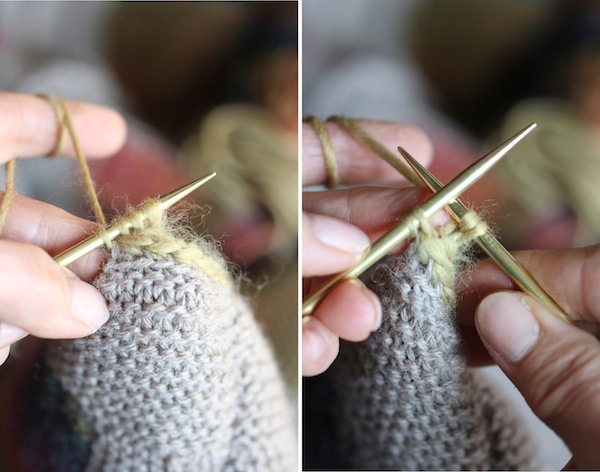 Hi Jennifer: In the post, there is a photo of my sewing the squares together and I talk about that a little bit in the post. If you look closely at the photo, you can kind of see what I did. I really just did a simple stitch to join them together. 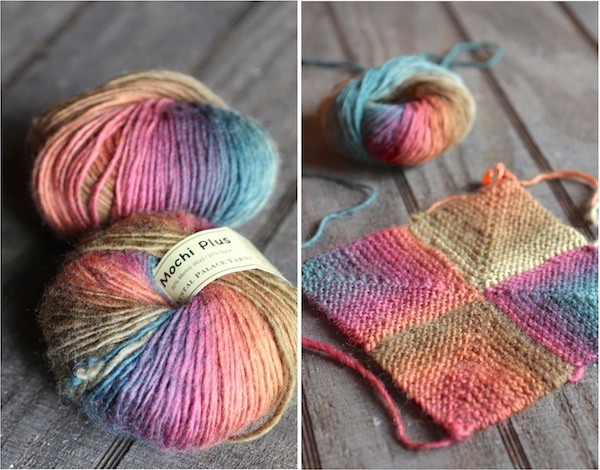 I would love to knit this and have been blessed with so much noro silk to do so. 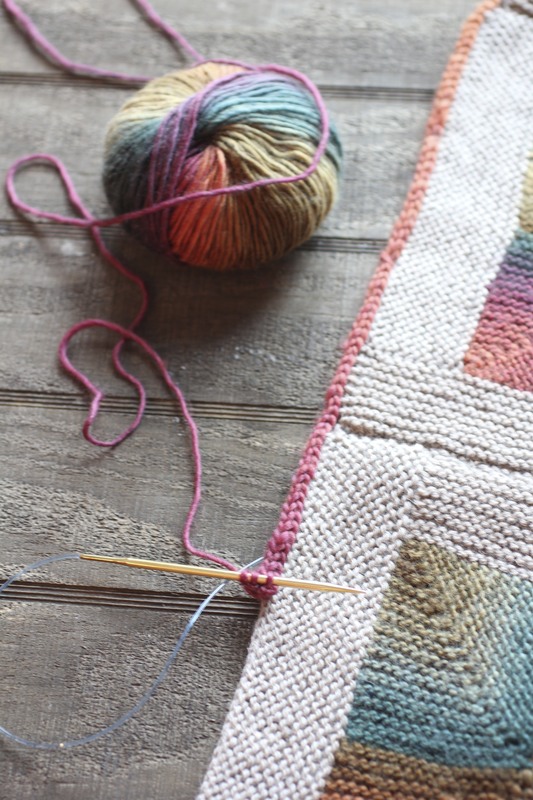 What is the stitch count for each mitred block pls. Melinda: It is in Kay Gardiner’s pattern. The link to the pattern is in the blog post. while this is a pretty pattern I am not going to pay 7.50 for it. I am going to try this blanket. Can you please explain how you knitted the background color? I bought the pattern from ravelry but it’s way to complicated. She hank you so much for your help. 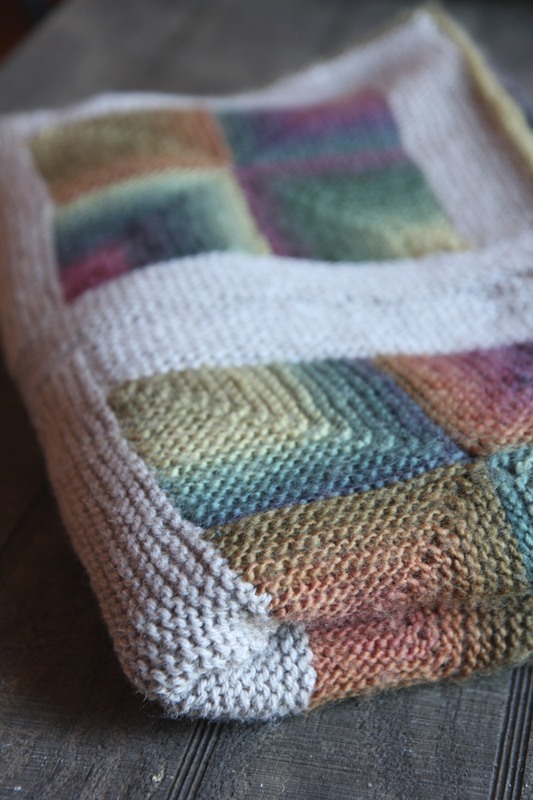 Mariza: The background is knitted just in a simple garter stitch – knit every row. Can you tell me what about the pattern you are finding confusing? I will try to help! Do I pick up stitches? How many left and right of the 4 squares? Sorry to bother you! I love your blanket and boughtvthe yarns already. 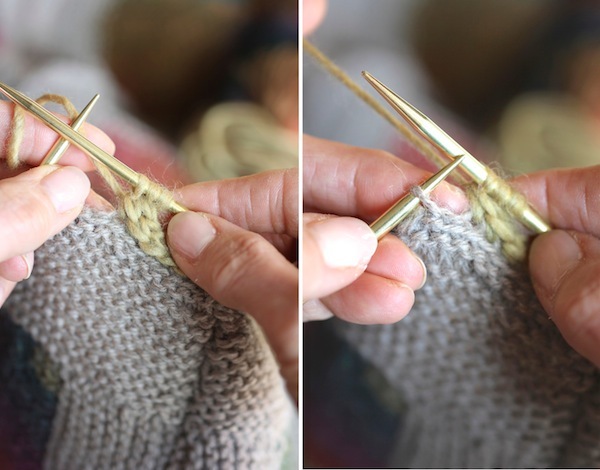 Mariza: Look over the pattern – where it says “Log Cabin Frame” are the instructions for the background knitting. 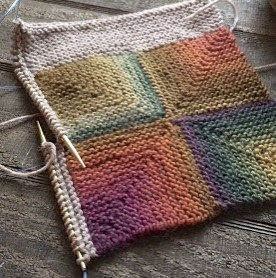 It shows a diagram of the mitered squares and tells you what side and how many stitches to pick up. It tells you specifically how many each side to pick up. 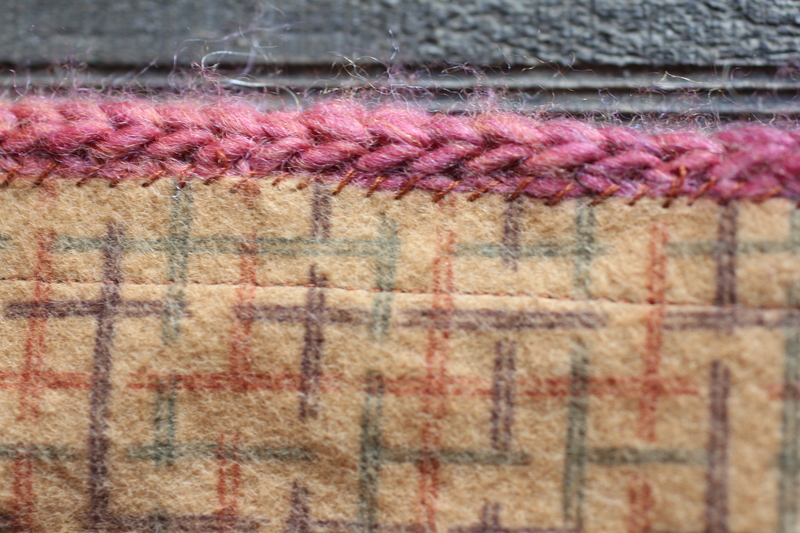 I’m so seeing how you did the corners in the I-cord binding. I love the blanket you made. The binding is the perfect touch. Wow! Just beautiful!! You’ve inspired me to make this!! Thanks for this! been looking for something like this to help me out! 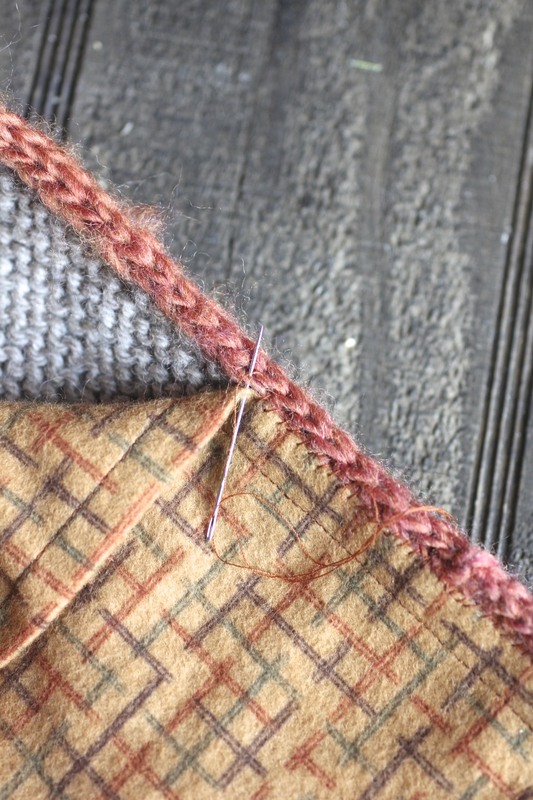 What type of sewing thread did you use? Have liked the mitered look but never tried. I think I’m finally realizing that I’m not so much into the actual making as to just enjoy and have – just in case.